In the wake of the devastating path of Hurricane Harvey, the Dallas Cowboys and the Houston Texans have shown how impactful sports communities can be in times of tragedy. The two were supposed to play a preseason game against each other in the Texans’ NRG Stadium on Aug. 31. Instead, they worked together to help reunite families and support relief efforts. The Texans were returning from a loss against the New Orleans Saints when the lack of a safe route prevented them from reaching home. They stayed in Frisco and used The Star, the Cowboys’ practice facility, as they waited for the day of the game to arrive. When it became obvious the flooding would not recede, the game was moved to the Cowboys’ AT&T Stadium in Arlington. Each ticket cost $25, with all proceeds going to hurricane relief efforts. Over 40,000 tickets were sold in the first day. Those plans changed when a safe route to Houston opened up and the Texans jumped on a bus back home. Anyone who bought a ticket to the game could either get a refund or transfer their purchase into a donation. 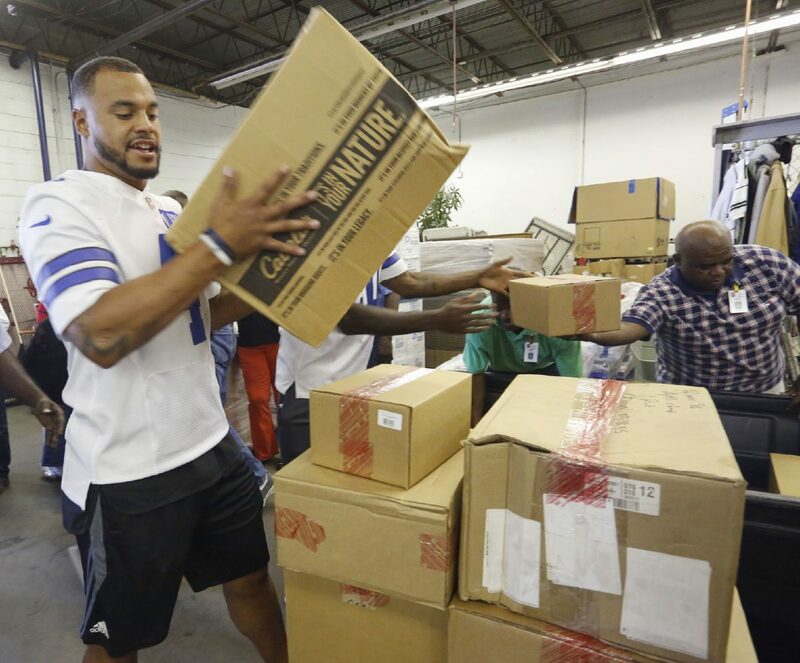 In a massive display of solidarity with their would-be opponents, the Cowboys held a telethon with the Salvation Army in which the players answered calls for donations. In total, the telethon raised over $2.3 million for the hurricane victims. Jones and the Cowboys donated $100,000 when the hurricane was making its way through Houston, and Jones pledged another $1 million while on the phone with Dez Bryant during the telethon. Bryant echoed those sentiments, adding that he and his teammates are doing everything they can to use their platform for good. Texans owner Bob McNair also pitched in with the promise to match whatever amount would have been made from the game. Texans defensive end J.J. Watt started a YouCaring fundraiser by donating $100,000 and setting the goal to raise contributions doubling that total. With donations in the millions from Jimmy Fallon, H-E-B, Ellen Degeneres and Walmart, the total as of Wednesday was at $28 million and still growing. Other players, like Cowboys tight end Jason Witten, are also using their prominence for a cause. Two club-level 50-yard line tickets and pregame sideline passes for the game against the Giants on Sunday, along with a Witten jersey customized for the winner, are being auctioned on Charitybuzz. All proceeds go to Witten’s SCORE Foundation in its support of the Houston Area Women’s Center. The high bid as of Wednesday was $3,050. Witten said he is proud of the work his team and people around the country have done to help Houston, and he intends to continue doing what he can.